← Exclusive opportunity for one guy only! Either way the result of that internal battle won’t have any part in this week’s post. As we have reached week 47 of this year. 5 weeks until I’ve completed this challenge and even less until the Mayans return from space and blow up the world with their corn and voodoo. I think that’s how it goes. So when I say this week has been a long time coming, what I mean is that the meat I cooked and ate this week has been due. For a while. As mentioned already. I’m back to a stage where I’m unsure about a couple of the remaining weeks, but this one has always been safely ticked up my sleeve, when I’m wearing a shirt. Even though I still have to fill the odd week and I’ve had some very run of the mill meats of late, this always had the potential to be great and climb into my top ten. So, what meat was hiding up my mostly non-existent sleeve? I am yet to do pig, or pork, as a part of this challenge. I have done Wild sow or female wild pig (boar) and that was f**ken fantastic if you’ll excuse the French influence in my language and currently sits at number 2 on the list so far. However, this one was pretty good. So let’s see what I did and readdress those rankings. Not all pig meat is created equal. Another sentence has never been truer. Well, actually probably heaps have, but either way this is true. Pig can be in many different forms of pork as well as ham and of course the gift of whatever god you do or don’t believe in- bacon. So a decision had to be made as to what form this blog would take up. Pork loin stuffed with ham and wrapped in bacon perhaps? (Damn, why did I just think of that?!). Nope. 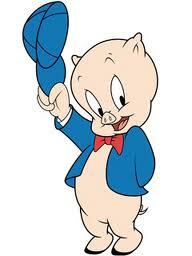 I decided on one of the few parts of the pig I have never cooked myself. Everyone’s eaten pork ribs before. Everyone. 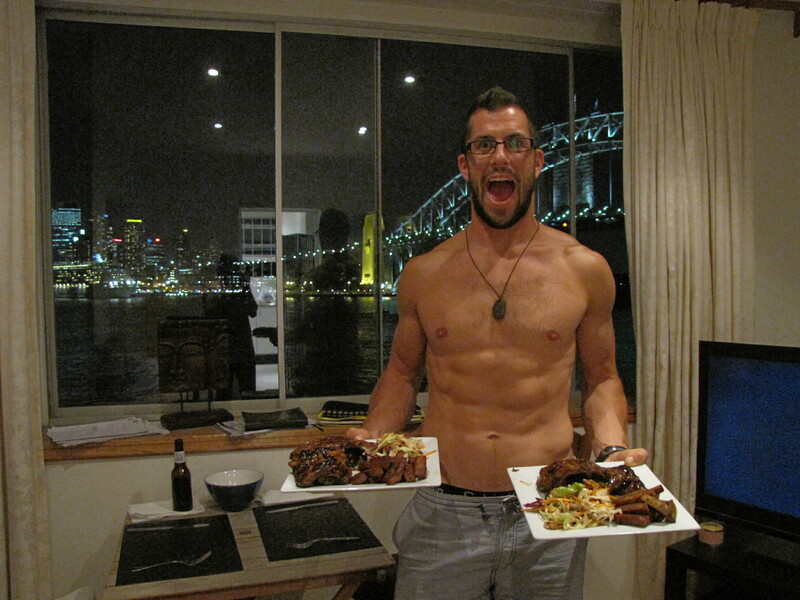 And if for some strange glitch in natures intended path you haven’t go and eat yourself some ribs now! Possibly one of the best things you can sit down to every once and a while. Usually basted with some ludicrously delicious sauce, which is quite possibly full of all sorts of ‘every now and then’ ingredients like sugar. However, it simply must be done. I’m pretty sure it could be religion changing, if you’re that way inclined. Anyway, I got my ribs from the guys at the butcher and the chef and decided on an American style BBQ Baby Back Ribs recipe that looked involved enough for me to push the meal out by a day so the flavours could infuse over night. I made the dry rub and added it to the bag with the ribs, mixed it about and let it get tastier by the minute over night in the fridge. 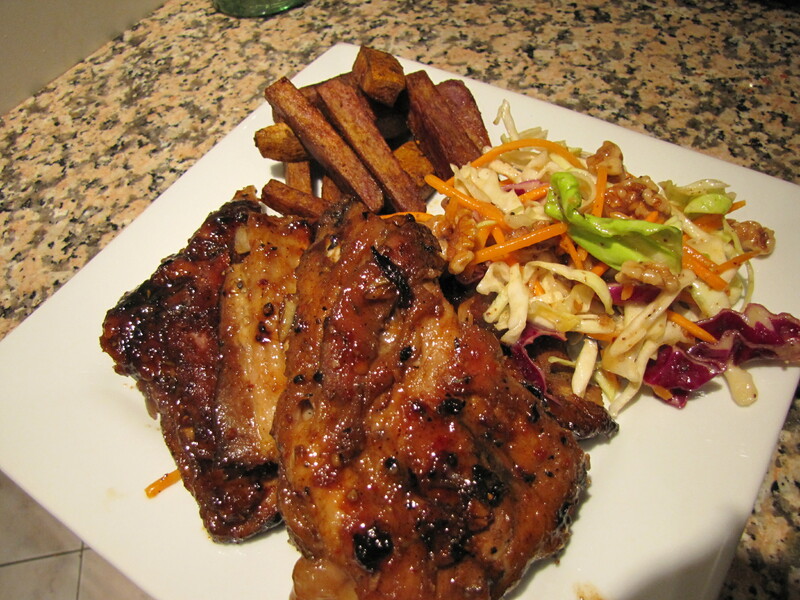 When the time came the following day to finish the job I was initially quite perplexed by the rest of the recipe, purely because whoever had written it was clearly drunk on ribs and it was what I would call incomplete. 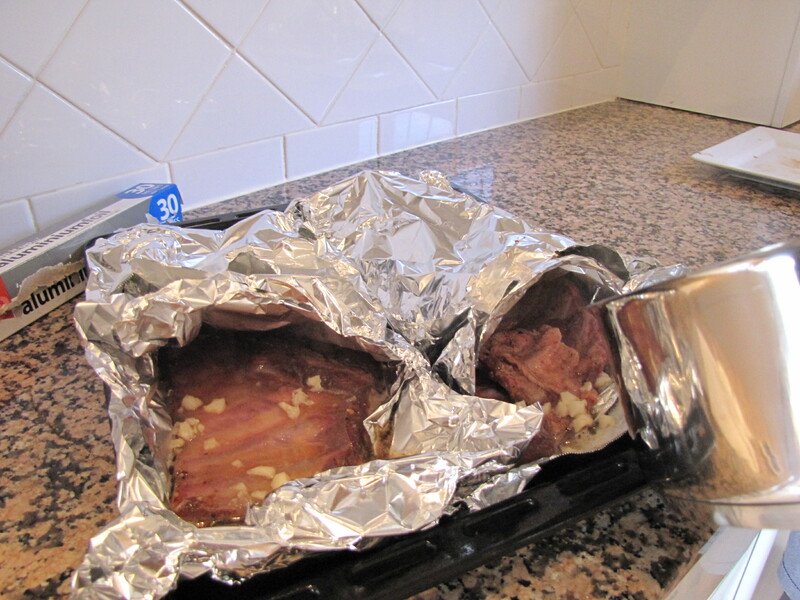 But with NN’s help I managed to fill the gaps and get the ribs into some little foil parcels filled with the now made sauce mix and into the oven to slowly and gently cook for 2 hours. What was in the mix? This was a variety of spices, peppers, garlic, some brown sugar (just because, you know, it’s ribs. They need it and sometimes so do I) as well as some white wine, honey, white wine vinegar and Worcestershire sauce with one or two others to complete the delightful mix of aromas now emitting from my oven. 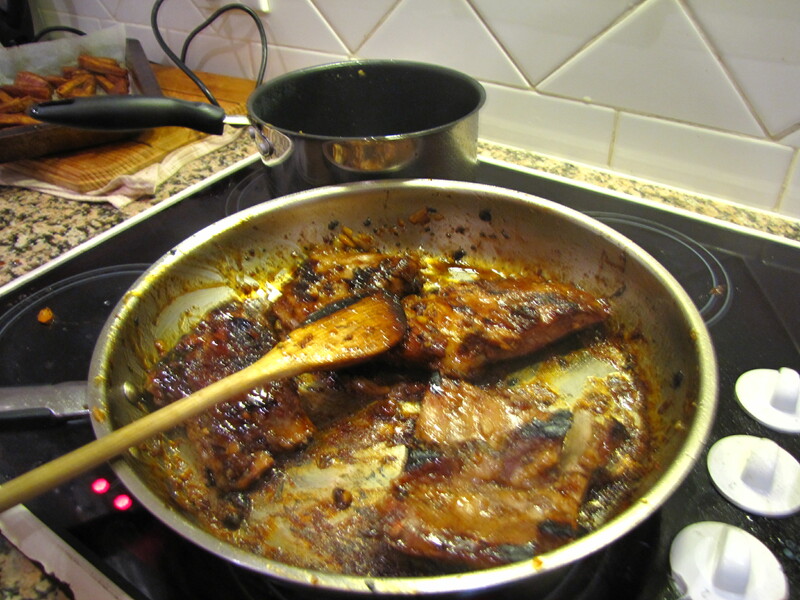 Next came taking the ribs from their parcels and pouring the sauce into a pot to reduce down to a glaze. This was harder than expected as nothing happened apart from the volume of liquid reducing. No viscosity entered the picture as planned so I ended up pouring some over the first lot of ribs, which I had now separated into more manageable portions and adding to the hot pan. They burnt a little and smoke engulfed the kitchen lounge and ah, the suburb. I removed these, put the rest on the pan and just poured the sauce over them in there. Voila! All of a sudden the sauce became sticky very quickly and the ribs were soon covered in a thick glaze, so it was out with them and back in with the others. It’s at this point I became very excited. This did not falter and soon NN and I were digging into a feed of Mike’s spicy rib’s with Hawaiian kumara chips and homemade coleslaw. When I say digging in I’m not exaggerating, in fact I’m not doing it justice. I went to town on these ribs and hole-y f**k were they good! I ate strategically and got the coleslaw and chips out of the way so I could focus and get and grubby as I needed. It’s safe to say that I loved these ribs! A touch spicy, well my lips were feeling the heat, so NN battled a little, but I pushed on through and soon had a bowl full of ribs bones next to me, greasy hands and a pretty well greasy face too. But! I was one happy camper! This isn’t something I would have often, firstly due to the effort involved. It wasn’t horrendous but it was a lot more involved than frying a steak. And secondly because of the ingredients in the recipe. The bag of brown sugar I bought for the rub will end up in the bin now, and good riddance to it. However, the pork was some of the best quality meat around. What it means for me is a favourable hormonal response to a meal like this that actually helps me stay lean and keep my six pack. Sounds weird huh? However, it is true but it is also an explanation for another time. My book to be precise. So, where will this make it on my rankings with the other 46 meats? I will reveal that later this week once I’ve truly assessed under my stringent criteria of How good was it 1-10? Not that stringent really. I can tell you, however, that this was one of the best meats that I’ve cooked for myself in a long time. Recipe has been noted and will appear again at some stage in the future. Now, if only I had 5 more meats like that to come I’d be chomping at the bit to get into them. 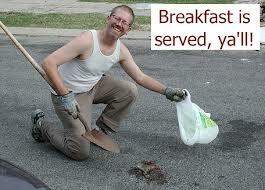 As opposed to slightly dreading having to possibly fight a homeless guy for the hedgehog he just scrapped off the road. Oh yeah by the way, as I write this I’m over 11,000 words into my manuscript. It’s Saturday, the sun is out and I’ve just added 2000 words to the book whilst busting this out in 45 minutes. I’m going to get outside for some fresh air, sun and possibly some ribs. It is very tempting. People of the internet, my journey is very quickly coming to a close. Only 5 weeks to go and I’ll have done what I’m pretty sure no one has done. What do you think so far? Anything you would like me to eat? Any comments? Queries about meat? What about ideas for a post week 52 celebration? Plus how on earth would I determine my most loyal readers..? Are you nominating yourself?